What I love most about Spring is that everything seems to be livelier, brighter, and simply more fun. Now is the perfect time to pull out all those pastels and playful colors from your wardrobe! I am wearing a lovely dotted blouse and strappy wedges Dolce Vita kindly gifted me. I wanted to wear these two things together but I didn't want a look composed of just white, black, and brown... Problem solved! I paired them with these awesome apricot colored pants! Just look at what a huge difference a colorful pair of pants can make on a rather neutral outfit without being overpowering! Lastly, I complemented the apricot color with the blues of the Dira bracelet by Callixto. It is such a gorgeous piece made with natural stones... moonstone, lapis lazuli, and agate. 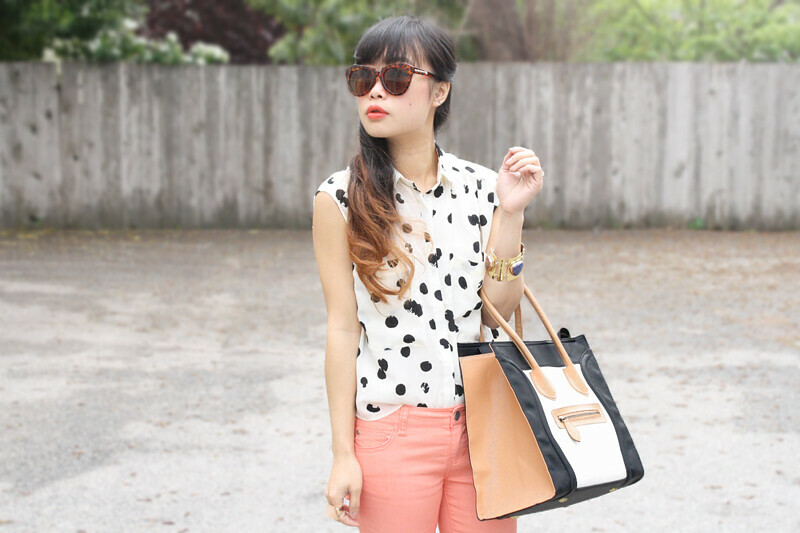 Makena dotted blouse c/o Dolce Vita. Jobin strappy wedges c/o Dolce Vita. Apricot colored denim from F21. Dira bracelet by Callixto c/o The Collective. Colorblock tote c/o VJ Style. That apricot pants really makes a big difference! Makes it feel more like Spring too! The shoes and bag look great together. Pretty top, too! You look perfect. Great accessorising too!! I love this look! So perfect for spring! love your bag and shirt! love your style and I am so happy I found you on Chictopia. following you now! Such a gorgeous spring outfit. Those colorful jeans look great with the dotted top. love this style ! pastel jeans are so great for the spring ! i wish i had a pair ! i need to start looking ! if you didn't mention it >_< amazing what one pop or color can do to an outfit !